When I think of Easter, I think of uplifting Sunday service, beautiful pastels, racing around hunting eggs, and baskets full of goodies. Once I became a parent, I wanted to keep our Easter traditions alive. What would be the most difficult aspect to tackle? The dinner? Nah I’m pretty savvy in the kitchen. How about the perfect Easter outfits? Nope got those. For me, it was the baskets. I grew up with my basket full of candies and a cute stuffed animal. 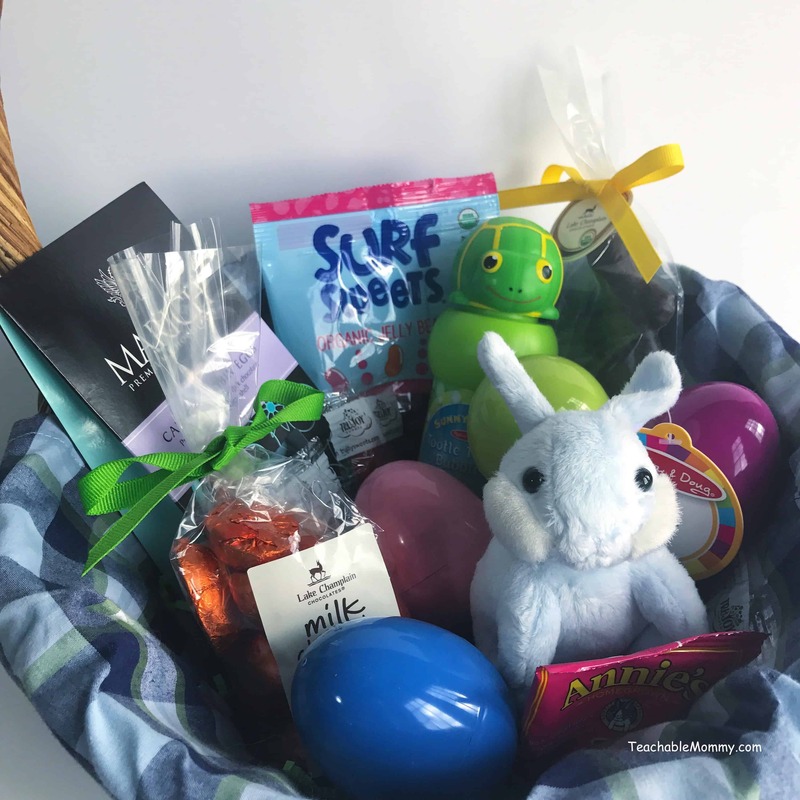 But with my own kids and newly minted healthier lifestyle, I wanted the baskets to have treats, but healthier ones, and a cute stuffed animals. Okay, I admit it, I have a stuffed animal problem. Don’t judge. Anyways, building a better Easter basket, wasn’t as hard as I thought it would be. There are lots of better-for-you options out there if you know where to look. At Whole Foods Market you can get everything you need for your better built Easter basket. When you shop there, you know any of the food you buy contains no artificial flavors, colors, preservatives, or sweeteners. I visited my local store and found exactly what I was looking for and more. Chocolate lovers: Trust me, those Lake Champlain and Divine chocolates are so tasty you won’t want to share. So maybe pick up another basket to fill just for yourself! Dibs on ALL the peanut butter ones! 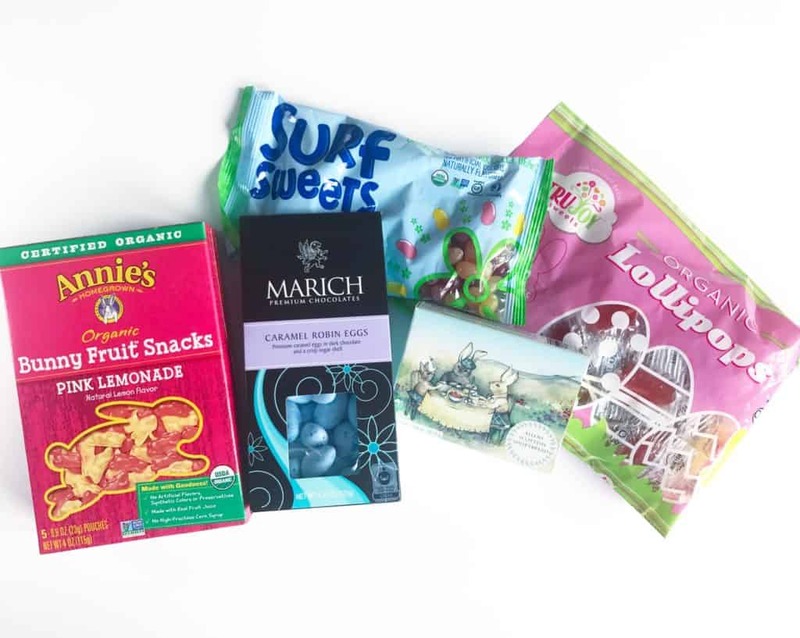 Surf Sweets Organic Jelly Beans, Annie’s Organic Bunnies, TruJoy organic lollipops, oh my! Does someone want to make a basket for me? 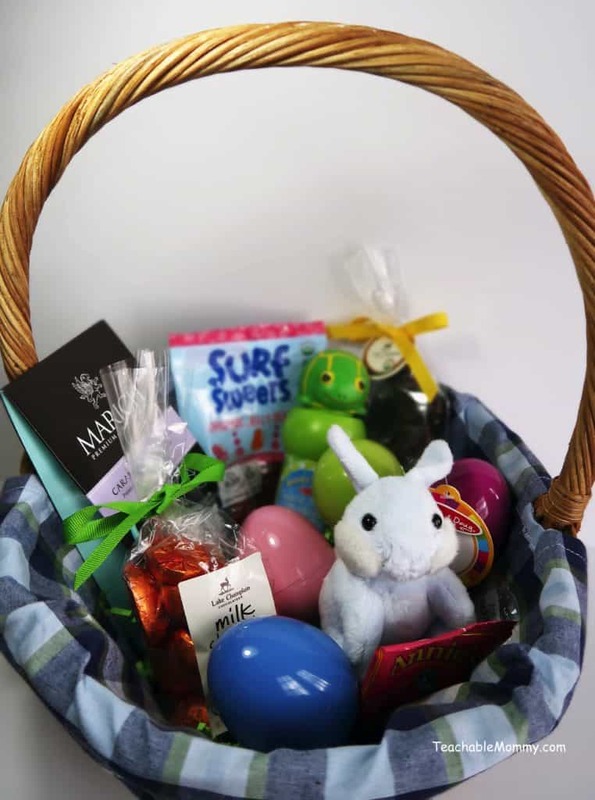 They also have eco-friendly grass, natural egg dye kits, eggs made from plant materials, adorable plushes, books, and more to fill their baskets. My son has a tree nut allergy so I have to be careful about what he eats. Whole Foods Market makes it easy for me to find treats that are not only safe for him to eat but that taste good too. One lucky winner will win a $50 gift card to Whole Foods Market! Find your local store here. Easter Bunny Dot Art For Kids! Previous Post: « Cars 3 Road to the Races Tour! Collecting the goodies and putting together the baskets has always been my favorite thing to do for Easter. I have been known to make baskets for my grown daughters. What an adorable Easter basket! Love the candies you chose. I always loved the big chocolate Easter bunnies. What great ideas! I’ve always liked Whole Foods Market. Your Basket is just adorable! I love the options at Whole Foods Market. I need to get organized and get the Easter baskets figured out, it is almost here! I like the ideas you have a lot, going with the classics is always nice. My favorite Easter candy is Jelly Belly Jelly Beans. I absolutely love that they are vegetarian. Otherwise, my next favorite is organic, fair-trade dark chocolate. I have a few easter baskets that I need to put together. Can’t wait to get started. Next week is the day to present them. Can’t believe how time flies. Very nice! I love that you have found such great alternatives to too much candy. I am definitely going to have to try out those bunnies. They look amazing! Here’s to your wonderful basket. Looks like a perfect Easter is around the corner. What a cute idea for a post! It’s hard being a mom sometimes – trying to straddle the line between giving the kids all the good things and making sure you look out for what’s healthy. This was a great reminder that you can manage both! My kids (and me) love annies fruit snacks. Whole Foods truly is awesome- I could totally use that git card! What a cute basket. I miss making Easter basket for the kid. Now that he is older he prefers GC. I also prefer shopping at whole foods for healthier options. What an adorable basket! 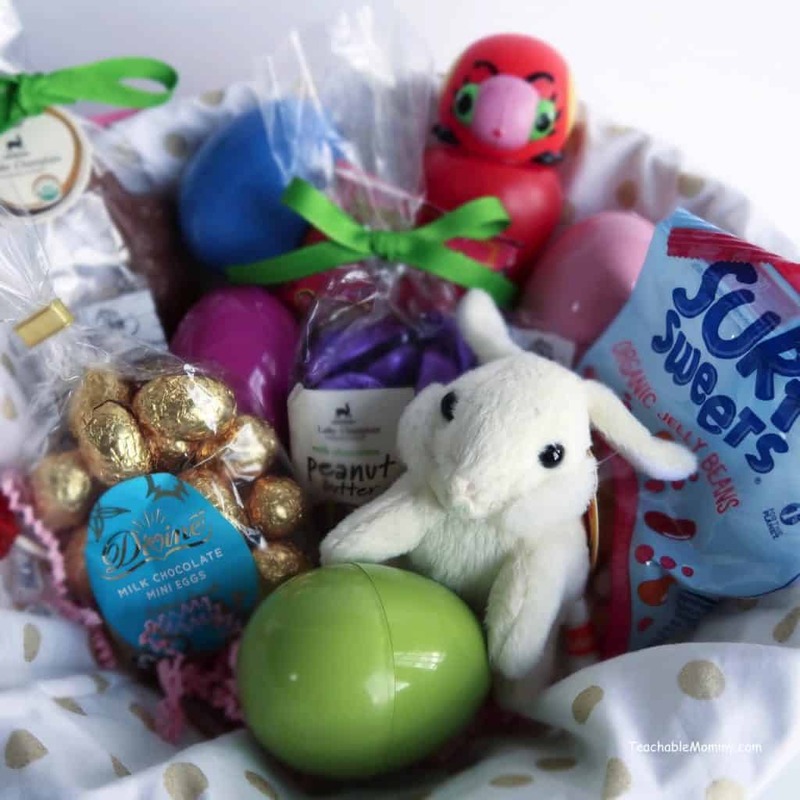 That little bunny is so cute and, of course, how can you not love all those sweets?! I love making baskets and getting them too! My boys can’t wait for Easter morning just to see what they get! Those chocolate bunnies look so good. Love the plush!! I’ve been preparing for Easter meals, but I totally forgot to think about an Easter basket. 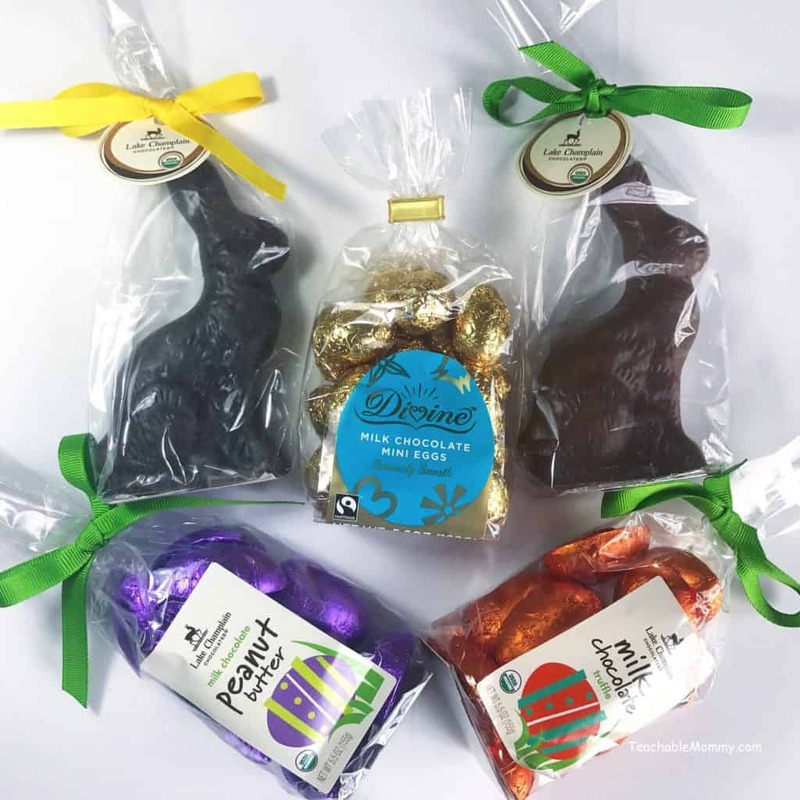 My son’s too young for most of the sweets, but I love the little bunny and it looks like Whole Foods has everything you need! I love anything with chocolate and PB! I have a bit sweet tooth! I would love to win a Whole Foods gift card to fill my daughter’s easter basket! This came at the perfect time. I was just thinking about putting together small baskets for my teens and needed some ideas. Love that Whole Foods has a some healthier options. This is such a cute basket. Thank you for the helpful tips. 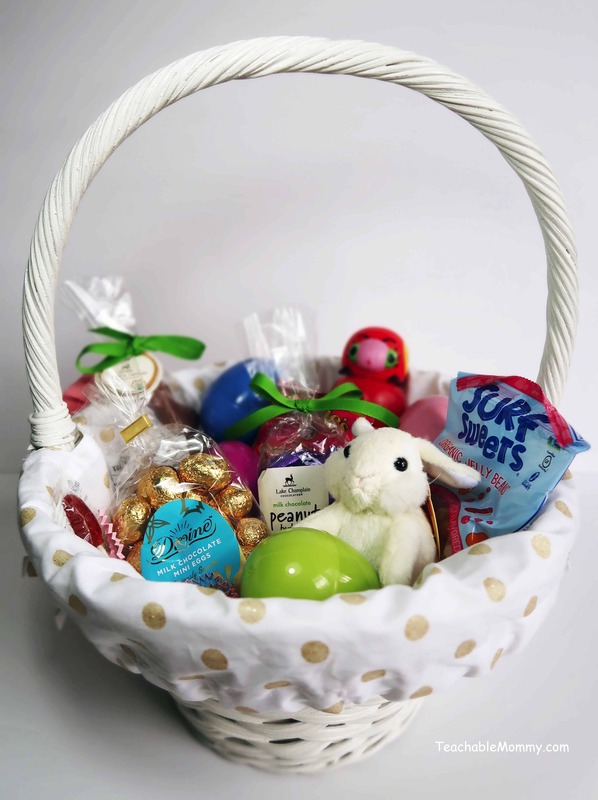 This Easter basket is so cute.Gift baskets are always great gifts!Specially,kids will love to receive such a cute basket! Gorgeous ideas! I love doing an Easter hunt in the garden with the kids and all our friends – so much fun! My favorite Easter candy is white chocolate, especially good quality white chocolate! My favorite Easter candy is Cadbury Mini Eggs. When they aren’t available, the Hershey ones are good. This is such a cute idea for Easter. My kids would love this! Might have to punch some ideas. That’s a fantastic little basket for Easter! A little stuffed toy is definitely a must! Mmm I’ll take dibbs on the peanut butter ones as well! These baskets look so good- would you like to come and make up mine for Easter? 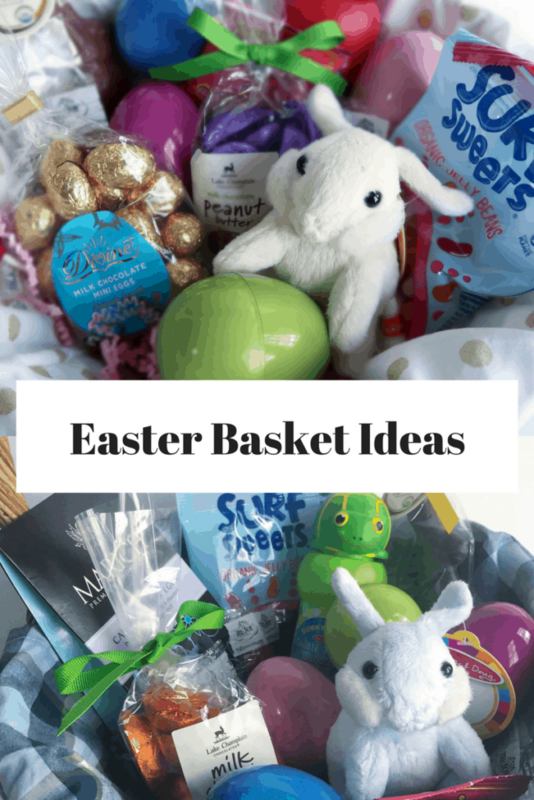 Love your basket idea! Whole foods is definitely the place to get what you’re looking for, plus I bet it made it much easier to find stuff for your son with his allergies! 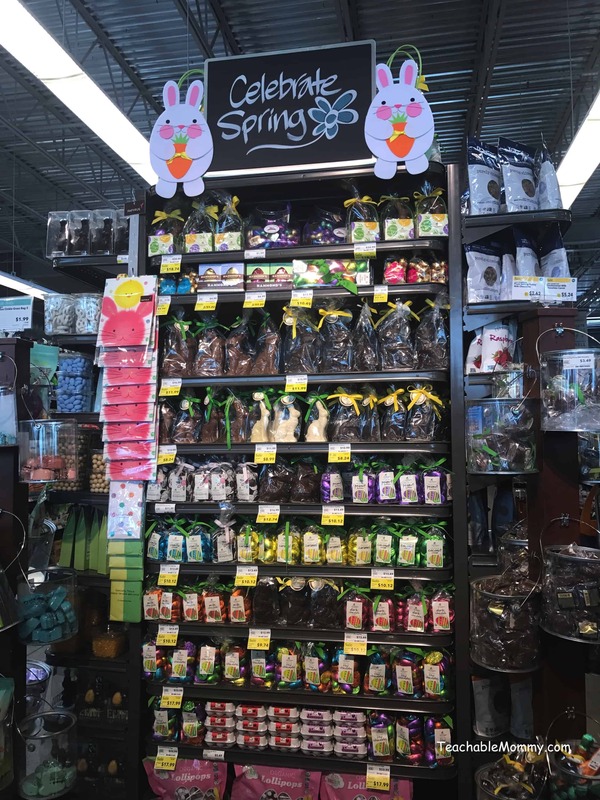 I was just eyeing the cute Easter goodies at Whole Foods last week while on vacation! It’s always nice to put together a basket that’s jam-packed with all the good and healthy stuff instead of your usual packs of candy. I would love to shop at Whole Foods and see what I can get there! I love having better options especially now that I’m taking this diet seriously for months now. It’s good to know that there are so many choices in this store! I’d love to check them out! What a great idea to put healthy food from Whole Foods in an Easter basket. Your baskets are adorable! those are awesome Easter ideas. i still need to find stuff for my kids. i may use some of these options. Oh I really love the jelly beans!!! I love this idea for an Easter Basket! My kids do not like a bunch of candy, so we find other fun things to put in them. My favorite candy we put in the kids’ easter baskets would have to be the little chocolate eggs from See’s. I love marshmallow filled milk chocolate eggs. Nice basket ideas. Love the giveaway !! My favorite is jelly beans! Very sweet makes me think of memories building baskets for my own kids who loved the chocolate bunnies. Chocolate and peanut butter eggs are my favorite. My favorite Easter candy is jelly beans. My favorite Easter candy is Reese eggs! My favorite Easter candy would have to be Cadbury eggs. I’m pretty sure all Easter Candy is my favorite…but if I truly pick one it’s probably the Reese’s eggs! My favorite Easter candy is Starburst jelly beans. I love jelly beans, especially the black ones. I really love Reese’s Peanut Butter Eggs! My favorite is Now and Laters jelly beans. So good! I’m hooked on those. Black jelly beans are my favorite. My favorite Easter candy are whoppers. My favorite is the Cadbury Eggs. I love cadbury mini eggs!